Worry-Free Warranty - 2 year warranty and provide friendly, easy-to-reach support. TRANSFER YOUR FILES IN THE BLINK OF AN EYE! In contrast with the regular USB 2.0 ports that allow a maximum transfer speed of 480 Mbps, the new, ultrafast 3.0 Ports, depending on your device, can offer you up to 5 Gbps; there\'s really no comparison on how fast you will be able to transfer your movies, MP3s, photos, and documents! ONE HUB, SO MANY DEVICES! Thanks to its incredible compatibility, this hub can be used with a slew of different devices, including chargers, u disks, hard disks, Macbooks 2015 and 2016, MacBook Pro 2016, Chromebook 2016, Huawei Matebook 2016, and much more - and did we mention that you can also transfer files from SD and TF Cards as well? PIECE-OF-CAKE INSTALLATION! All you need to do to enjoy your new hub\'s multiple benefits is to... plug it in! Unlike many similar products, it does not require any specific software, drivers download, or any other installation process; it\'s a plug-and-play hub! A TRUSTY TRAVELING COMPANION! 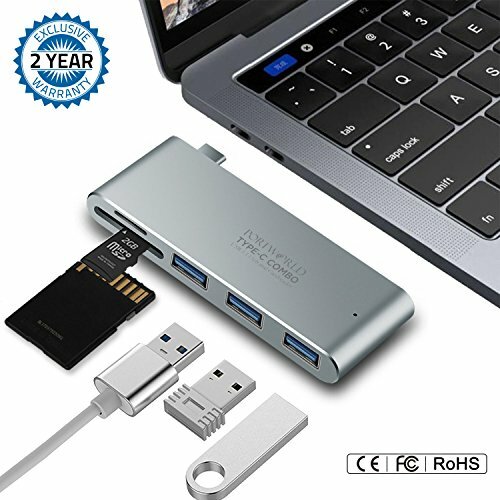 Whether you\'re a businessman or just a lover of travels, you will love how compact, lightweight, and easy to carry this exquisite USB Type-c hub is; with 90mm length, 34mm width, and only 11mm height, it can come with you wherever you go and make your life easier!